Forex in Indonesia – What’s it all about? Indonesia, recognised as one of the Far East’s fastest growing economies is becoming an economic giant in South East Asia. Indonesia, recognised as one of the Far East’s fastest growing economies is becoming an economic giant in South East Asia. If another country could be added to the BRICS then surely Indonesia would qualify. Indonesia has all the characteristics an economy needs to develop; rich in natural resources, proximity to trading partners and a large domestic population. Topped with a craving for online trading, Indonesians have been attracted to FX, the most liquid asset class for over eight years and as conditions develop the market is set to grow further. Indonesia has slowly been lifting itself off the bottom of the lists of corrupt and poor nations as the South East Asian nation looks to chase the development rally that neighbors like Singapore and Malaysia have encountered. To this day Indonesia has nearly 46% of its inhabitants living below $2 a day. The divide between rural and urban residents has been shifting as cities and towns expand. The rural population is declining, currently there are an estimated 119 million people living in rural areas as opposed to 122 million in 2007. Indonesia is a mixed economy with both a strong private and government sector. The country has extensive natural resources, including crude oil, natural gas, tin, copper, and gold. Indonesia’s major imports include machinery and equipment, chemicals, fuels, and foodstuffs. The country’s major export commodities include oil and gas, electrical appliances, plywood, rubber, and textiles. The South East Asian nation was on a rapid journey on economic prosperity during the 1980s and 90s however the 1997 Asian crisis put extensive and lengthy pressure on the country. Since the crash Indonesia has been building its domestic infrastructure and in 2011 rating agencies Moody’s and Fitch returned the title of investment grade. Indonesia has a staggering $1 trillion GDP and is expected to be one of the top ten economies over the next ten years. The country’s unemployment rate is at 6.5% and the country has a labour force of 116 million people (45% of population). Since the turn of the century the country has had a volatile encounter with a cycle of positive and negative factors impacting the economy. On the one hand the Jakarta Stock Exchange was the best performing market in Asia in 2004 up by 42%. On the other hand, in 2005 harsh movements in oil prices affected the country’s oil imports as prices rose to the $65 a barrel mark. The government responded by raising fuel prices by 126% in October 2005 and consequently raised the policy rate by 42bp in the second half of the 2005. The currency reached Rp 12,000/USD 1 before stabilizing and inflation peaked at 17%. Government intervention managed to bring some fruit, but 2007 was another challenging year; as seen by the unemployment rate in February 2007 hitting 9.75%. However, despite the global economy slowing its pace, Indonesia’s economic growth accelerated to a ten-year high of 6.3%. Indonesia has a relatively developed capital markets. The stock exchange was governed by the Dutch colonial government in 1912 but during the wars (WWI & WWII) closed down. The exchange was re-opened in 1977 and a financial regulatory body was formed to manage the dynamics of the exchange, this was called the Capital Market Supervisory Agency (Badan Pengawas Pasar Modal, or Bapepam). The following years saw substantial economic growth and as a result the exchange was privatised in 1992 under a new ownership; the Jakarta Exchange Inc (JSX). There were further developments during the 1990s and on March 22, 1995 JSX launched the Jakarta Automated Trading System (JATS). In September 2007, Jakarta Stock Exchange merged with a smaller exchange that served the needs of the Eastern region, the Surabaya Stock Exchange. The merger resulted in the Indonesia Stock Exchange. Indonesia Stock Exchange, IDX, (in Indonesian: Bursa Efek Indonesia) is based in the capital city of Jakarta. As of 28 June 2010, the Indonesia Stock Exchange has 458 listed companies with a combined market capitalization of $411 billion representing 50.48% of GDP. Retail investor participation is very low in Indonesia, there are around 300,000 registered stock market investors, and the bourse aims to push this figure to 2 million by 2013. Stocks listed in Indonesia are made up of traditional commodity based sectors e.g. industrial materials and energy. The banks and financials have the largest share with 25.23%, followed by Industrial Materials 20.03%, Consumer Goods 14.71% and Energy 13.72%. Two telecommunications firms are listed Antonius Fitrianto on the NYSE, PT Indosat Tbk and TLK PTTelekom Indonesia. The average daily volume in Indonesian stocks is around US $450 million. Forex has been promoted by the local futures brokers over the last 10 years, as the economy has been going through a transition. Investors have been looking for methods to earn money in a short period of time and forex opened up doors as it was being promoted as a get rich quick product. Russian based brokers witnessed this trend and started entering the market around 2003. Brokers include InstaForex, FXOpen, MasterForex and Exness, Forex4you and FBS. 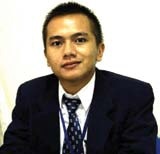 Indonesian owned brokers include Sky Forex and a few others. These firms offer services on and offline in Bahasa Indonesia and usually have either a master IB or a representative office. Major international firms like FXCM and Alpari entered the market by partnering with a local introducing broker and setting up their own brand represented by the IB e.g. http://www.fxcmid.com. 2) The other segment appreciates the risks associate with the product/broker and prefer regulated solutions, where the FSA has always been a regulator of choice. However, due to the adverse opening criteria, Indonesians generally opt out and look for alternatives. Two solutions close to home are with Singapore and Australian regulated brokers with laxer based brokers with laxer account opening procedures. This is an excerpt from a detailed article on Forex in Indonesia, taken from the Forex Magnates Industry Report for Q4 of 2012.